The Crickmanistani’s have a droid with them that was a coffee dispenser on one of the levels of the Death Ball. Well anyway, this droid got friendly with, I mean really friendly with if you know what I mean, one of the design droids on board and has a copy of plans of the Death Ball. Well Helvi analysed them to find that there is a weak spot in the design in a location called the Upper Inner Thigh, apparently very tender and painful if struck. So here’s the plan. Me and Helvi are going to teleport into the control room and take out the Detractor beam while Belinda and George hit the Upper Inner Thigh with a “Bouncer” which is a bomb. So we break the beam, get the zark outta there and blow the Death Ball up. Yeah, I know weak as but worked for George Lucas. Belinda and George jettison themselves in an Escape pod just before we dock. Don’t ya just love how spaceships that travel in deep space always have escape pods, I mean where ya gonna go? Helvi and I beam ourselves into the control room. In a split second Helvi takes out two guards and the control door with laser canon fire, gees, no wonder Gez eats all his veggies. We roll behind a bank of computers and let the return fire go over our heads. My beautiful creams are turning beige to honey colour at the moments and I think the nanobots are struggling to keep up. Helvi pops her head round the corner and with two shots takes out another two guards. There’s three left plus, you guessed it, the evil Lord Deaf Vision. Laser cannon fire is rapidly being deployed in our direction. With that Helvi winks and dives across the floor rolling and firing in the one action, I mean man, she is poetry in motion. Helvi takes a hit and has her arm blown off but momentarily she keeps firing. I stand up and see Lord Vision standing there, resplendent in his black armour and helmet. “Ur, um sorry old boy, but I don’t have a sword” and just as those stupid words fall out of my mouth Vision throws me a sword. “Take guard” he cries and charges at me with incredible power and speed knocking me to the ground. Luckily I used to watch Errol Flynn as a youngster and I just put my sword up in time. Just then my phone rings, I mean mobiles are a pain aren’t they, always ringing when its inconvenient. I pull the phone out of my pocket and answer “Hello, Sandy speaking” I respond rather nonchalantly. “Well Gordon, I’m a bit busy at the moment. Lord Vision and I are having a sword fight to the death and right now he’s lying on top of me trying to cut my throat.” I inform. “Hey Sandy, I made up a name for the AFL team in WA, The Fremantle Lamingtons, get it, funny eh” scoffs Gez. “Can you put Gordon on I really have to go” I beg. And there ends the first part of The Father O’Way Chronicles. The next part will probably be called “The Umpire Raises His Finger” followed by “The Return of the Ball” if you get my drift and of course it will totally meaningless as usual. 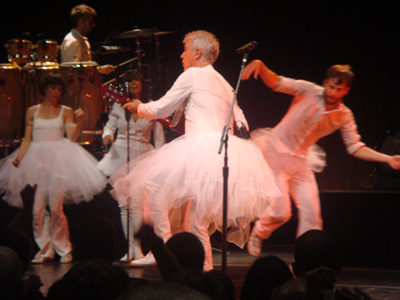 * This photograph will have a strange resonance for those who went to the David Byrne concerts recently. ** I would like to express my great appreciation for Hung’s masterful chronicles, and Warrigal’s digital wizardry – together making Father O’Way live, breathe and generally piss fart around ! Good on you ! Great stuff, Hung! Happy Dionysia! Happy Gordon Day Asty. Thanks for the encouragement. Hows Hell’s Hospital going? You tell me, Hung… just posted the latest episode. And we all from the cast, wearing our tutu’s, wish you Hung and of course Tutu too, a very good Christmas and thanks for entertaining us!